Grease the idiyappam mould with oil so that rice flour will not stick. * Wash & Soak 3 cups of raw rice in water for 3 hrs.Drain the water and when it is half dry grind it in the mixer to a nice flour and spread them in a towel and cover it tightly and steam it in the broad vessel for 20 min.cover with the lid.Then sieve it and spread it in a towel.Keep under sunlight for 4 days.Again sieve it and store it in the air tight container for 3 months. 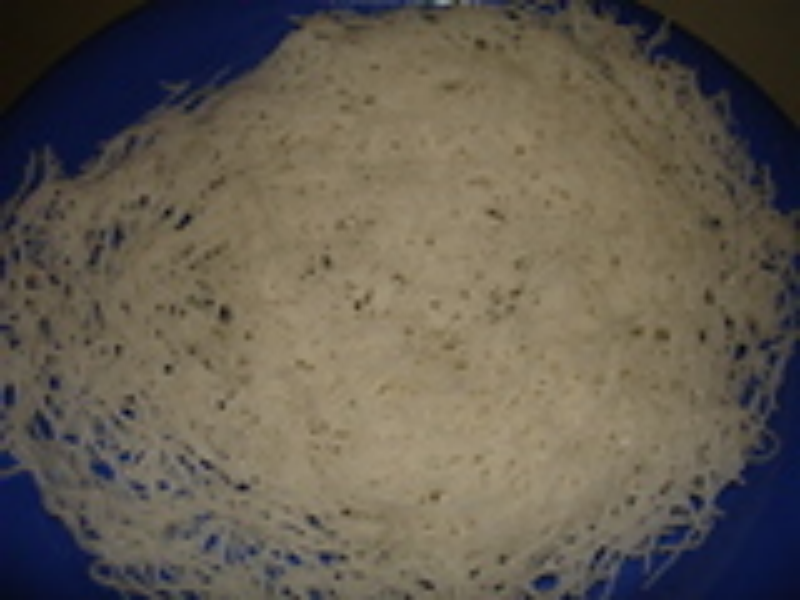 Rice flour for idiyappam is ready. Take the rice flour,salt in a bowl and pour the boiling water gradually into the flour and make a soft dough. Take a portion of the dough and put it in the idiyappam mould & squeeze it in the greased plate or in idli plate or bamboo basket and press it in clockwise direction. Serve hot with coconut milk and sugar. Dear Hfshama,It won't come well with shop made rice flour.u can make this rice flour at home in the mixer.Please try. halo rajeswari. can this idiyappam be made out of readymade rice flour which we get in shops? Dear Rashmi,1.u can make with regular mould with small holes.use fine sev mould.2.When it's cooked it will not stick.right consistency.3.u can make it spicy with various types like by seasoning with mustard seeds,chilli and squeeze lemon or coconut,can make with tamarind spicy or with grounded sesame with red chilli but idiyappam is taken plain in ceylon and in tamilnadu.its good for heart patients.u can see my coconut sevai and puliyogare sevai,different method..4.u can try with MTR rice noodles or concord but they r not as fresh as home made idiyappam or sevai. this one is a nice & new dish for most of d north indians i suppose... can we use these noodles to prepare some spicy noodles, as v dont prefer much sweet.. if yes, how can it be prepared & what measures shud v take while recooking or tossing it in spices..